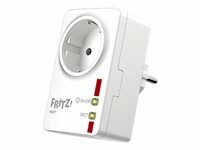 With the FRITZ!DECT 200, you can intelligently manage the power supply to connected appliances and measure, record, and evaluate energy consumption. This smart plug is connected to your home network via securely encrypted DECT technology. It can be easily operated via PC, notebook, smartphone, or tablet - and even via the Internet when you're not at home.